Simple, elegant and oh so French! 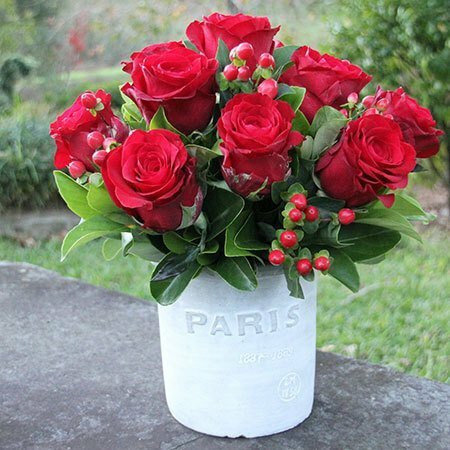 Send velvety red rose stems delectably designed by our florists in a chic white `Paris` pot, (exclusive to Sydney deliveries only). Finely primped with fresh green foliage and seasonal berries, this luscious gift comes in two size options and is perfect for anniversaries, a romantic gesture, or a `just because you`re awesome` gift. Order these gorgeous red roses online or by calling toll free on 1800 66 66 46. *Please note: The pictured rose arrangement and `Paris` pot is exclusive to Sydney & Brisbane only. For flower deliveries outside Sydney & Brisbane, the team will place your order via an affiliate florist network to recreate our style and presentation as closely as possible. Product : Perfect flowers, beautifully presented and loved by recipient. 2016-03-18 Service rating : I ordered deluxe with 20 roses and it came with 10. I`ll never buy any flowers from your website, and I`ll tell anyone I know not to. Product : Product didn`t match description on your website at all. 2016-01-18 Service rating : Fantastic!